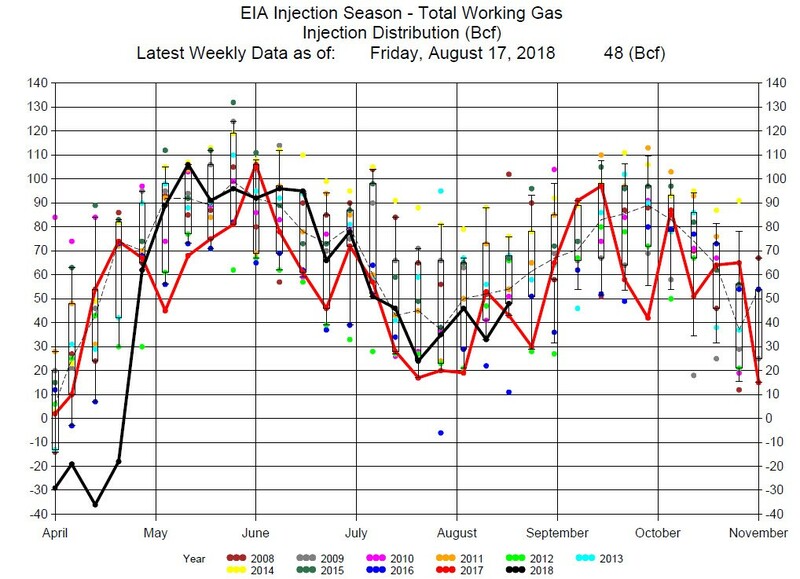 The EIA reported a 48 Bcf Injection for the week ending August 17, 2018. The injection was below the average, 52 Bcf, for this week of the year, and below the average of expectations of a 52 Bcf injection. 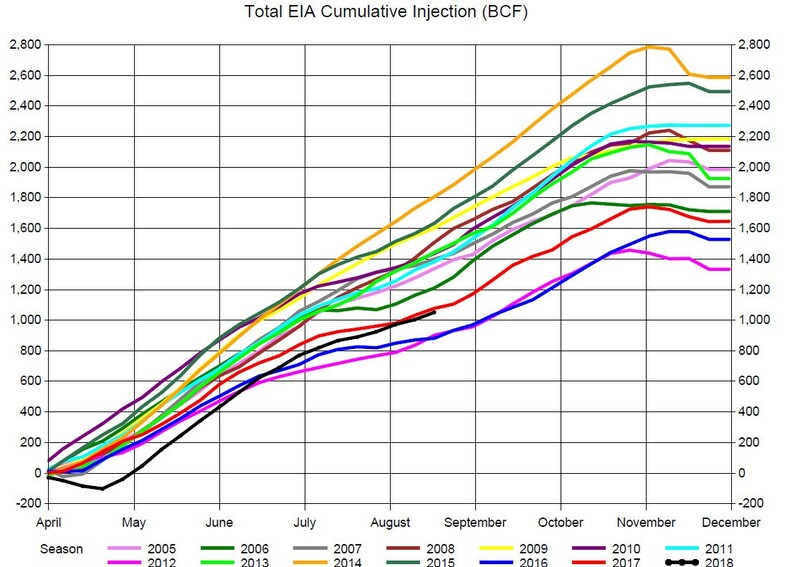 Expectations had a range from a 40 Bcf injection to a 56 Bcf injection. It was another week of withdrawals from the Pacific Region and the South Region due to the hot weather. 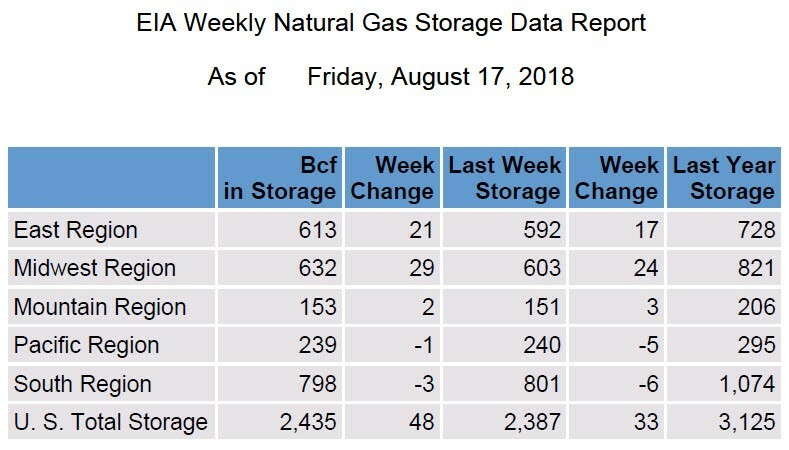 Storage at 2,435 Bcf is now nearly 700 Bcf below the storage level at this time last year. 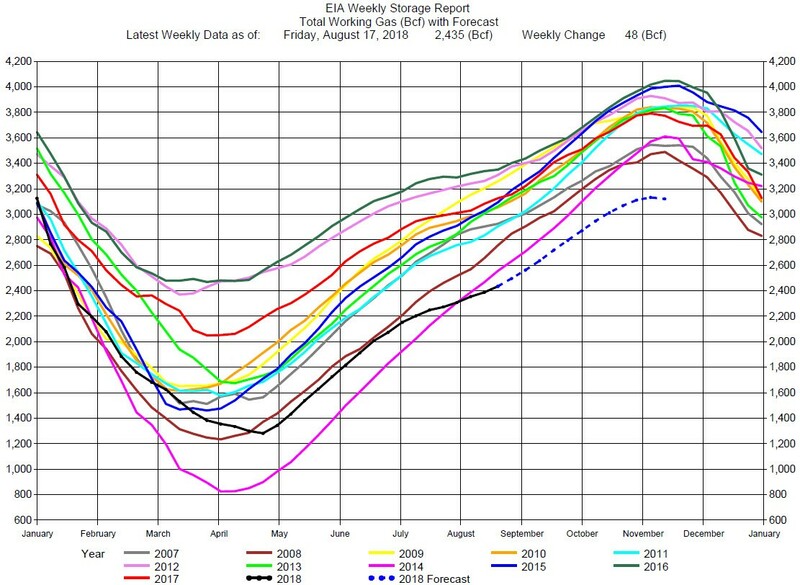 The computer model projection of ending storage (see blue dashed line below) has storage at a record low of 3,150 Bcf by November, again about 700 Bcf below last year’s ending storage. Storage levels that low could have serious consequences should there be a colder than normal winter. There are expectations of new additional production of natural gas available for the winter which is probably why prices are not higher. However, if the additional production does not materialize or is not sufficient then there will be major price spikes during the winter season. Prices moved up with the release of the report but traded in a narrow range through the remainder of the trading day, ending basically unchanged for the day. Prices have moved up to the $2.97 level after establishing a strong uptrend. We still suggest consideration of trading from the long side, and especially if prices can break through the long term trading range above $3.00.